Debbie Salas-Lopez is the Chief Transformation Officer at Lehigh Valley Health Network (LVHN) in Allentown, Pennsylvania and a Professor of Medicine at the University of South Florida, Morsani College of Medicine and the College of Public Health. In 2009, she was appointed the Leonard Parker Pool, Chair of Medicine, a role she served in until 2015. She completed medical school and a residency in Internal Medicine at Rutgers University, New Jersey Medical School and obtained a Master’s Degree in Public Health, Health Policy and Healthcare Administration at the School of Public Health. In 2016, she was invited to be the Convocation Speaker for Rutgers University New Jersey Medical School where she received the Distinguished Alumnus award for her outstanding contributions in the field of medicine. She has been a visiting scholar at the Harvard Institute of Healthcare Policy and completed fellowships with the National Cancer Institute and the Association of American Medical Colleges Health Services Research Institute. She is a Fellow of the American College of Physicians, an Affiliate Member of the Association of Professors of Medicine, and a member of the Northeast Consortium on Cultural Competency and Medical Education; a group comprised of 12 medical schools in the Northeast region. Dr. Salas-Lopez has been a standing reviewer for the National Institute of Health (NIH) study sections with a special focus on primary care, health literacy and access to care. She was the Principal Investigator of an NIH award to establish a Neighborhood Community Cancer Center Program and has extensive experience in extra-mural research. She has collaborated with many community-based organizations on issues related to prevention, screening, and healthcare access and has partnered with healthcare institutions to address community needs. She has led initiatives to improve quality of care, contain costs, and strengthen primary care through care coordination and establishing patient-centered medical homes. She has also been successful in forging new partnerships with external constituents including schools of higher education, industry partners, and physicians and practices with the network vision and has published on this work. She is a nationally recognized speaker and educator in the areas of women in medicine, women leaders, culture, healthcare disparities, equity in care for vulnerable populations, and the impact of social and economic factors on access to care. 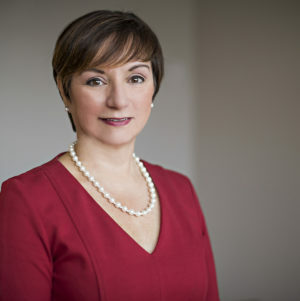 In her current role as Chief Transformation Officer (CTO), Dr. Salas-Lopez is responsible for developing and executing strategies in population and community health to improve value for our community and network with a focus on areas where we have the most clinical/social risk and financial risk, cost avoidance opportunities, unnecessary cost and care variations, and improvements in care transitions for patients. She is also responsible for developing and executing the network-wide community strategy that aligns with the better health pillar of the Triple Aim, enables our Community Health Needs Assessment, and creates synergistic partnerships with community partners, national foundations, industry, educational organizations and others using collective impact. In collaboration with other senior network leaders, she helps develop, test, and implement innovations that transform care delivery to improve access, patient satisfaction, care for high risk patients, grow market share for new patients, and create consumer loyalty. Lastly, she is responsible for executing network strategies with external constituents that enables LVHN to accomplish its strategic plan to create new markets that expand our footprint, create new business streams and joint venture partnerships, achieve greater value for consumers using technology, and creates opportunities for financial growth. This work informs cost transformation initiatives, alternative payer arrangements, payment reform, and organizational accountability for success. It is work that embraces our community and our mission.